My week at the Italian and French Riviera has passed. I have been home for exactly 2 days and still, I feel the exhaustion from the trip. Reality plopped itself down right in front of me immediately as soon as I stepped inside our house. I missed it. I missed my daughter too, who for this trip, decided not to come with us because she wanted to stay with her nonna (grandmother) & zia (grandaunt), go to the beach everyday, color her coloring books and stay in a tranquil ambience in the company of two of her favorite people. This she told me in a serious tone while playing together. I have to respect that, coming from a 3-year old. Sometimes, my husband and I make sure that both our kids get separated for a while. We would like them to understand themselves without relying and copying each other and establish their own personalities. In fact, after a week of being apart, we all saw the changes in them. Raising kids is one of the most difficult things an adult can face. We found that a few days of separation works wonders. I like traveling alone with my kids. Last year, I took my daughter to France which she enjoyed immensely and even thought that she was French herself when we came back home to Italy. I took a little backpacking trip with my son a couple of years back, taking trains to reach our destination. There was a big smile pasted on his face the whole time. In a few years, these moments will be lost when they would rather stay with their friends. I just wish that both of them would remember the trips we had been doing. The Riviera, both the French and Italian side, had amazing seafood gastronomy. Simply done with garden-grown herbs and vegetables and freshly-caught seafood cannot compare with the other dishes I have had. It's a great experience all on its own. Rekindling my fond memories of the past days, here is a recipe that I find apt for this moment. 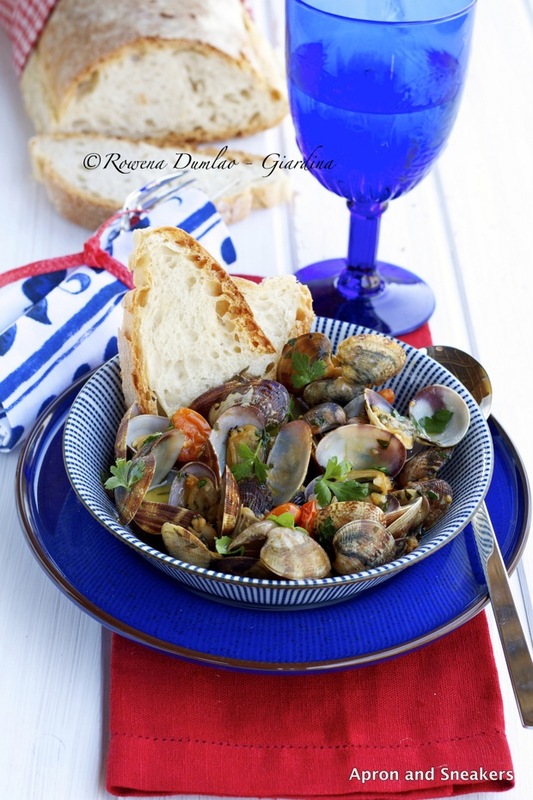 Here is a very simple dish of vongole (clams) cooked in prosecco (Italian sparkling white wine). 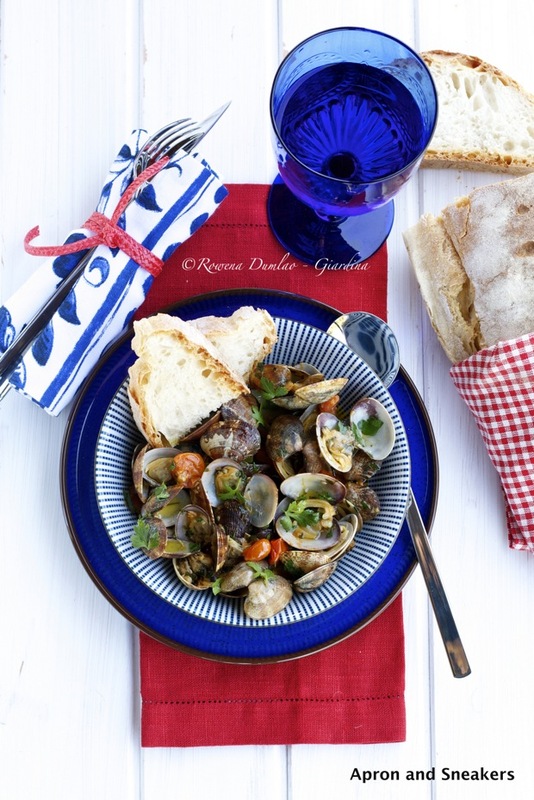 It's one of the best ways to enjoy vongole and I hope you will like it. Sauté 1 garlic & the chili in a saucepan with oil until golden. Add the clams. Make them all open. Discard closed ones. Filter the liquid by making the clams & sauce pass through a sieve. 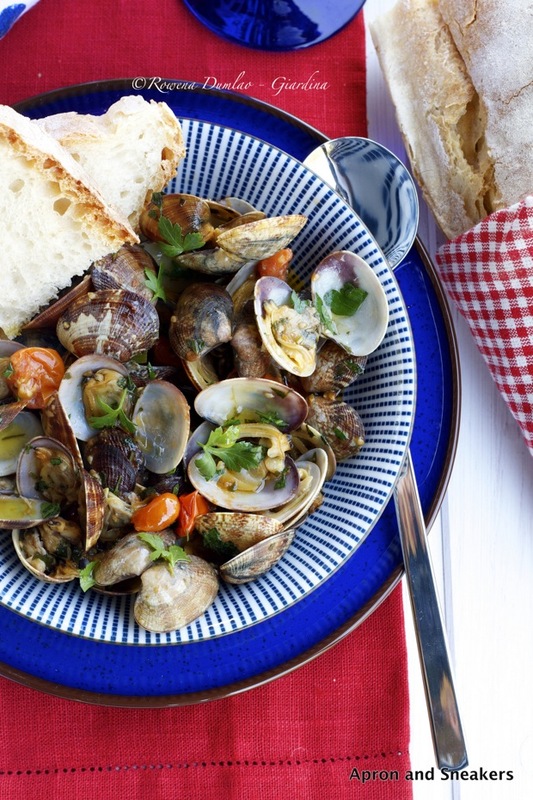 Set aside the broth in a container and the clams in another container. In another saucepan, sauté the other garlic & about a tablespoon of parsley. Add the tomatoes. Cook for 5 minutes. 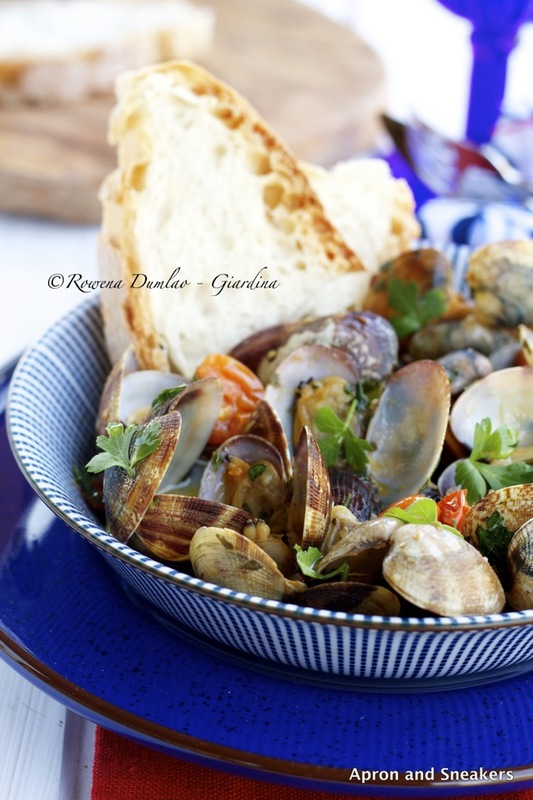 Add the cooked clams, liquid and prosecco. Let it boil then simmer for 10 - 15 minutes. Season with salt (if still needed) & pepper. Sprinkle the rest of the parsley. Drizzle with extra virgin olive oil.